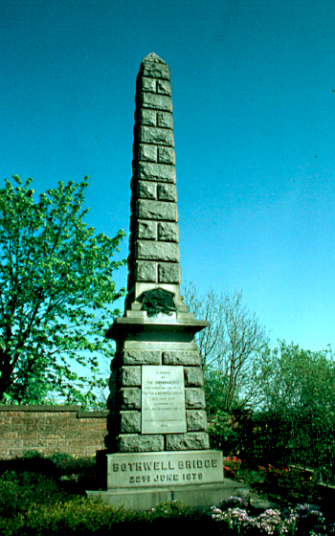 The Bothwell Bridge memorial is an obelisk, located on the north-east side of Bothwell Bridge. The memorial is positioned at a busy road, so access to it can sometimes be difficult. At the close of the half-hour, or, as some reports say, before it, the royal troops opened fire upon the bridge. They had planted three cannon behind a parapet that had been thrown up during the cessation from fighting, but their firing was too high, and went over the heads of the Covenanters, who, with their one piece, replied so effectively that they killed several of the Royalists and drove them from their guns. David Leslie shouted after them as they fled, "Would they fleg for country fellows?" but still they ran; and the cannon would have been taken had not the barricade on the bridge barred the way for bringing them over. New troops were brought up and renewed the attack, but still without success--the three hundred bravely defended the bridge. For three hours they stood unflinchingly. The reinforcements they sent for to Hamilton Moor never arrived; their ammunition ran short, and messengers were despatched for more, when the answer came that there was none to spare, and that they must retire to the main body on the moor. "With sore hearts" they withdrew, for they felt that the bridge was everything, although Hamilton believed it was wasting time to defend it, and that the best course would be to let the enemy form on its south side, and then drive them into the Clyde. They fell back in good order, and the royal troops at once crossed the bridge and formed upon the moor. When Rathillet and his brave companions retired to the main body he found them, he says, well drawn up, and very hearty, and all ready to march down upon the enemy. For the moment their divisions had ceased, "and every one seemed to encourage the other." Wyck's picture of the battle presents them as drawn up in eleven different squares, with six standards, two detachments of horse, one cannon, and a body of skirmishers in front. All appeared in a measure prepared, as they assured Hackston, for a battle "with hand strokes," when, just as they had begun to advance, a cry got up, which ran from company to company, that their leaders, who seem largely to have been friends of Welch, had disappeared. To some extent the report was true, for Paton and Cleland were then doing their best to find officers to take their place. But there was no time to reason, for while the cry was running through the army, the horse, under Weir of Greenridge, made a movement of their own from the centre to the front of the left wing. The officer in command ordered them out of the way, but they cried out that they would not, as they had been placed where they had been to be cut off, and then, as if struck with some sudden madness of fear, they wheeled about, 140 horse, dashed through the left wing, broke it in pieces, and carried it away in their flight. At that moment the cannon of the Royalists began to play, and their line made an advance, but there was no fighting; only 15 men were slain on the field of battle. The panic on the left wing spread to the right, and it speedily fled in like manner, Sir Robert Hamilton among the foremost, "leaving the world to debate," says one who was there, "whether he acted most like a traitor, coward, or fool." The royal troops, that stood in awe so long as there was any opposition, at once advanced when they saw their opponents flee without fighting, and eagerly gave chase, and slew nearly 400 of the fugitives as they fled before them. No quarter seems to have been given, save to 1200 who surrendered in a body and who were later imprisoned in Greyfriars' Churchyard.